As climate impacts grow more severe, oil refineries face increasing risk. Fossil fuel companies need to disclose these risks to shareholders and the public. When we think about fossil fuel companies in connection with climate change, we’re likely to focus on the role of their products in generating carbon emissions. But these companies are also, like everyone else, subject to the impacts of climate change. Oil refineries, in particular, are highly vulnerable to climate impacts such as sea level rise and increased storm intensity. And many of the companies that operate refineries are not disclosing these risks adequately to shareholders and local communities. Our 2015 report Stormy Seas, Rising Risks focuses on facilities run by the top five U.S. refining companies, assessing both the extent of their climate risk and the companies’ failure to address that risk and publicly disclose it to their investors. They are frequently built in low-lying areas, often near the coastline. 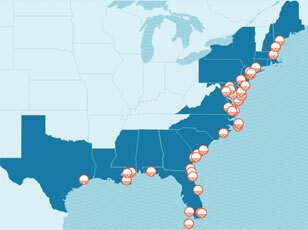 120 U.S. oil and gas facilities are situated within 10 feet of the local high tide line. They have long operating lives, and companies typically update or expand refineries in existing locations rather than building new ones. They do not have high profit margins, so any disruption in operations may have a material impact on cash flows for the company and ripple effects across the economy when the public pays at the pump. There is already a track record of disruptions to refinery operations due to climate-related events: recent storms such as Katrina, Rita and Sandy have caused significant refinery outages. Such events are likely to happen more often as climate impacts worsen. Communities adjacent to refineries are also vulnerable to climate impacts and have been disproportionately affected by spills, blasts, and other industrial accidents at these facilities. To reduce these vulnerabilities, companies will need to address both mitigation and adaptation to climate risks. On the mitigation side, they need to reduce their own emissions and stop opposing emissions-reduction policy measures. On the adaptation side, companies must actively consider, report, and act to prevent or minimize climate-related risks to their facilities. As global temperatures continue to rise, impacts will strike coastal areas in several interconnected ways. 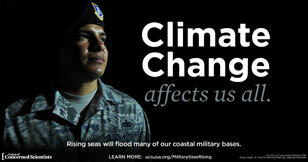 First, sea levels are rising. This is primarily due to the expansion of seawater as it warms and the melting of mountain glaciers and polar ice sheets. In the United States, sea levels are rising fastest along the East and Gulf Coasts, where many oil refineries are located. Climate change is also expected to increase the strength of coastal storms, so that when hurricanes form, they will fall into more intense categories. Both of these effects will amplify the impacts of storm surge—the rise of water above normal tide lines that accompanies severe storms such as hurricanes and nor’easters. As sea levels continue to rise, the flooding and destructive waves associated with storm surge will be more severe—and felt further inland. Stakeholders are beginning to put pressure on fossil fuel companies to address climate risks. In recent years, shareholder resolutions have emerged as a useful tactic to influence companies to address climate risk. Starting in 2004, investors began asking the SEC to help improve companies’ climate risk disclosures in financial filings; in 2010, the SEC issued guidance to companies for discussing climate risks in their annual Form 10-K reports. While a few companies have begun to publicly address risk from the physical impacts of climate change in a substantive way, many have not. Investor groups and UCS partnered to send letters to the companies highlighted in this report expressing concern about this lack of disclosure. Stormy Seas, Rising Risks focuses on the top five U.S. energy companies with respect to total crude-refining capacity. For each company, one coastal refining facility was chosen based on perceived risk, which was determined by vulnerability of location and historical storm damage. Using data including property boundaries and elevation, recently published, localized sea level rise projections, IPCC climate change scenarios, and National Weather Service storm surge models, the report maps the potential impact on each facility of current and future storms of various strengths. The report also looks at the companies’ recent SEC filings to determine the extent (if any) of climate risk disclosure. Only one of the five companies, Phillips 66, made any physical climate risk disclosure in its filings, and the report rates this disclosure as “poor.” Instead, companies address climate risk only in terms of the possible impact of emissions regulations. Valero Energy Corporation. The largest refiner in the U.S., Valero has nine refineries on U.S. coasts, including several in low-lying areas on the Gulf of Mexico. Valero’s Meraux, LA, refinery (125,000 b/cd) sits 10 miles east of New Orleans and has risks both from sea level rise and storm surge. SLOSH MOM modeling shows that by 2050, sea level rise will make the facility vulnerable to Category 2 hurricanes (slide 3), which are not currently projected to flood the facility at all (slide 2). With sea level rise to date, a Category 3 storm could put parts of the facility under 10 feet of water (slide 4). Phillips 66. The 10th-largest refiner in the world, Phillips 66 has 11 refineries in the United States, three of them on coasts. The company’s Linden, NJ refinery was shut down for three weeks due to damage from Superstorm Sandy in 2012. SLOSH MOM modeling shows that with sea level rise to date, a Category 1 hurricane could put parts of the facility under water (slide 2). If a Category 3 storm hit, the facility could be inundated, with potential for parts of the refinery to be under 10 feet of water (slide 4). Sea level rise, along with changes in hurricane intensity, could worsen storm impacts in the future (slide 3). The refinery could also be vulnerable from storm surge as a result of nor’easter storms occurring at high tide. Exxon Mobil Corporation. The largest refiner in the world, Exxon Mobil has three major refining facilities along the Gulf of Mexico. The report looks at the Baytown, TX facility, the largest petroleum and petrochemical complex in the United States, which was shut down in 2005 due to damage from Hurricane Rita. Exxon Mobil’s Baytown, TX, refinery (560,500 b/cd) sits at the north end of Galveston Bay, 25 miles east of Houston. SLOSH MOM modeling shows that with sea level rise to date, the facility faces risks from storm surge associated with stronger storms (slide 2). A Category 3 hurricane, for example, could inundate parts of the property and has the potential to leave some structures under 15 feet of water (slide 4). Sea level rise and increases in the proportion of more intense storms could make such storms more damaging to this facility in the future (slide 3). Marathon Petroleum Corporation. Marathon Petroleum is the fifth-largest refiner in the world, with seven refineries in the U.S.—including three along the Gulf Coast. Marathon’s Garyville, LA refinery experienced a significant reduction in operating capacity after Hurricane Isaac in 2012. Marathon Petroleum’s Texas City refinery (84,000 b/cd) sits adjacent to its Galveston refinery to the west and Valero’s Texas City refinery to the south. SLOSH MOM modeling shows that with sea level rise to date, the Marathon Petroleum Texas City refinery and those around it could see storm surge impacts from a Category 3 storm or higher (slide 2), with operations closest to the coast being inundated (slide 4). In the future, sea level rise and changes in storm intensity could put the facility at greater risk for storm damages (slide 3). The close proximity of refineries in this area means that damage at one facility could also affect operations at others. Chevron Corporation. The eighth-largest actor in the global refining industry, Chevron operates four near-coast refining facilities in the U.S. The company’s Pascagoula, MS refinery was hit hard by Katrina in 2005, causing major problems and an extended shutdown. SLOSH MOM modeling shows that given its location in the Gulf of Mexico, even a Category 1 hurricane could penetrate the Pascagoula facility (slide 2), and a Category 3 storm could leave parts of the facility under 10 feet of water (slide 4). Companies should be more transparent about their risks from—and contributions to—climate change. The SEC should push companies to follow its guidelines for disclosing climate risks, educate them about how to comply, and go beyond guidance to issue a rule requiring companies to report on climate risks annually. Investors who have previously pressed companies to consider climate risks should continue to do so; investors new to these issues should focus on the financial effects of climate change and press companies and the SEC to improve their responses. Refineries should conduct facility-specific risk assessments; adapt their facilities to withstand climate impacts; reduce the global warming emissions of their operations; use safer inputs and processes whenever possible; be prepared to respond adequately to disasters when they occur; and be transparent about chemicals and processes used, safety records, and preventive measures. States should enact laws to enhance safety, transparency, and preparedness for climate impacts at refineries. The public should demand that companies not only consider physical climate risks, but also take appropriate steps to protect surrounding communities.